The recent wet weather has made some of the local tracks difficult to ride, so I decided to try a route which would work well even after heavy rain. The result was this very large (> 120km) loop of the North of Brisbane. 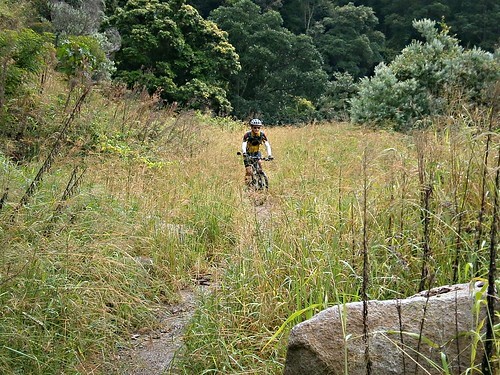 Incidentally, if you’re a Mountain Biker new to Brisbane – this is one way to see a bit of everything: Rainforest, Bush, Mountains, City Centre, Mangroves… all in one day. 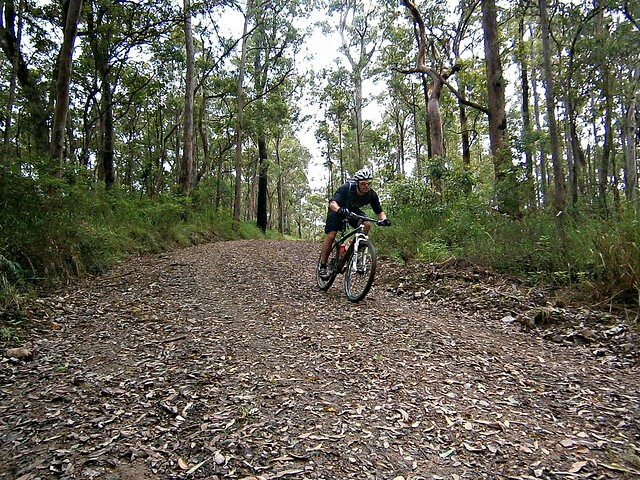 I started from Lawnton, and met up with Paul at Bunyaville, where we headed west to Ironbark and the Pony Trails in Samford Valley. 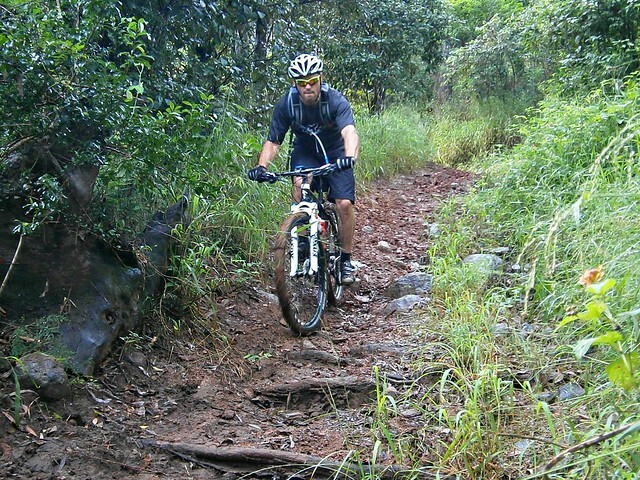 Some of the pony trails around Samford are rocky and steep. The recent rain has made them muddy too – which just adds to the fun. We followed the pony trails to the bottom of “The Goat Track”. Nature continues to reclaim the Goat Track. A trafficable road with cars and trucks going up and down it 15 months ago, it’s now overgrown with land slips and drops off the edge – a perfect mountain biking trail. It offers some great views of Moreton Bay to the east, and is still the easiest and safeest way up to Mount Nebo if you keep your wits about you. If you ride DOWN it, I’d suggest you take it easy, especially near some of the land slips. At Mount Nebo we topped up on snacks and drinks, and made our way to the trail head for South Boundary Road. South Boundary Road is a dirt fire trail that runs from Mount Nebo to The Gap. The landscape varies as it undulates from one end to the other. 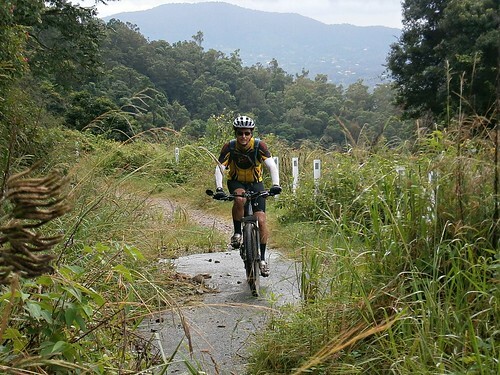 East to West is a tough climb, but heading the opposite way down to The Gap offers some really fun fast descents. Either way you need to be prepared to do some climbing. This time we passed dozens of walkers training for the 100km Oxfam Trail walk. (A 100km walk? Those guys are crazier than me). If any of you walkers are reading this, thanks so much for thoughtfully moving to the side of the trail as we came hooting down it on our bikes. We really appreciate it! At the end of South Boundary Road we skirted the northern part of Gap Creek and started the climb up the side of Mount Coot-tha. 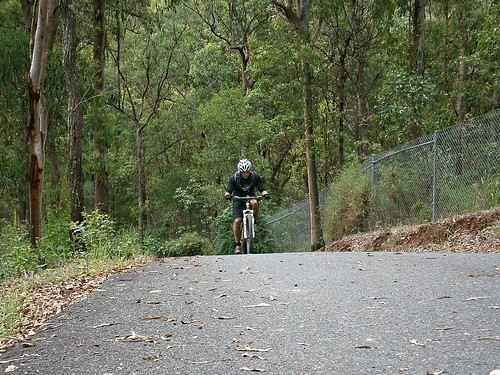 While many road cyclists grimace at the thought of taking the “easy” bitumen route up Mt Coot-tha, Mountain Bikers do it the hard way – up the side of the mountain. Highwood Road starts with a short climb up a 20% bitumen gradient, followed 1,110 metres of pain up a steep dirt fire trail with a dozen water bars thrown in to make the climb even harder. Paul and I nailed the hill yesterday – the first time for me. Once we reached the top, we then followed the “Powerful Owl” trail behind Channel Nine, which undulates for a while before steeply descending to Silky Oak Picnic Area. A few friends had warned me to beware of the steep drop at the end which consisted of 100 metres of a controlled skid to the bottom over rocks and ruts. Thankfully, the DERM graders had been through recently. The path was smoother and safer than before, and the ride down was much easier than I had anticipated. From here, we followed bike paths through Toowong into the centre of Brisbane, out through the Roma Street Parklands and finally joining the Kedron Brook Cycleway which we followed to Toombul, Nudgee and Deagon, before finally heading west through Bracken Ridge and Bald Hills home again. I really should pay tribute to Paul. 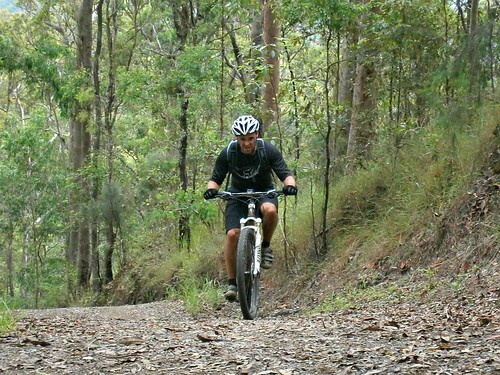 By the time we got to the Kedron Brook Cycleway, the climbing and distance had started to affect both of us. Paul was hurting but didn’t want to spoil the ride by finishing early. So he persevered, despite the fact that the last 40km were in the rain. We were soaked and exhausted by the time we got back to Lawnton. All up, 124km with almost 1,900m of vertical ascent, and over 6,500 kcal of energy. I drank a lot of sports drinks, a few cakes, a few bottles of Orange Juice and lots of water. 1. The distance. We were on the road for 10 and a half hours which is a logistical issue if you need to be back home before dark. 2. The climb up Highwood Road. After toughing it out on the hills of South Boundary Road, that last little climb is NASTY. 3. The rain at the end. A little bit of rain is nice. It keeps you cool. A lot of rain is uncomfortable. Epic ride Neil! That is a big distance in those conditions. I’d never heard of the Tour Divide till you mentioned it. I’ve just spent the last 20 minutes checking out their site. That looks awesome, doesn’t it? Sure does! How about the scenery!! I have got some gear together and I hope to build up to a crack at it over the next few years. Er..the ride that is, not the race!